Hearts are to launch a share offer which will could allow supporters to control over 10% of the club. Director Sergejus Fedotovas indicated it could also be the first step towards fans taking control at Tynecastle. If fully subscribed, the 11p shares will raise £1.79m for working capital and youth development investment. "Now Hearts needs its supporters more than ever and we count on this appeal being heard and supported," Fedotovas told the club website. 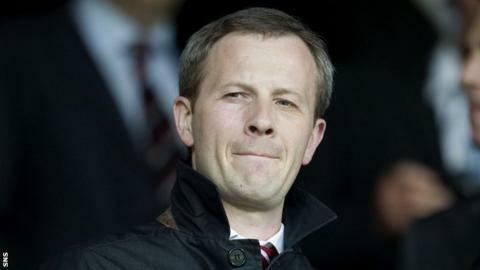 "This share offer provides supporters of Hearts and other interested investors with a real opportunity to increase their interest in the club while contributing directly to the investment in some of the best young footballing talent in the game," he added. "It is a very important moment in Hearts' history where supporters are invited to express their interest and secure the future of the club. "If this first share offer is successful we believe that future proposals could be considered that may eventually allow for Hearts supporters to take over the club entirely. "Every pound raised by supporters, after costs, will be reinvested into the club and we expect that this will be a popular offer. "There are a range of excellent benefits that will also provide attractions to supporters and we're pleased that we have a relationship with supporters that makes this share offer a truly viable option for the development of the club." A group led by current majority shareholder Vladimir Romanov took control at Tynecastle in 2005 and since then Hearts have regularly finished in the Scottish Premier League's top six and have also won the Scottish Cup twice.